So, I have a lot of bookshelves, with a lot of stuff in them. For instance, in the living room (where I do most of my art) there’s a big wall of 6 bookcases, plus another half-height one full of games, plus another one on a different wall. And then there’s 3 in the bedroom. So we’re starting small! The leftmost bookcase in the big Billy set (yes, we love Ikea) on the living room wall is half-width, and has 8 shelves. Let’s start at the bottom, which only has one photo because the stuff in front isn’t totally blocking the stuff behind it, for once. The back row is a set of antique childrens’ books from my dad’s brother (and later my dad, I’ve been assured), which I loved as a kid and asked to take with me when I moved. It’s The Book House series, 6 pairs of books with increasingly complicated stories in them, including a lot of old fairy tales. Next to them is a battered old pair of Black Beauty and My Friend Flicka that I read as a kid and haven’t gotten rid of yet because reasons. In front there’s some relics of my years as a pyromaniac, when I used to burn colored candles into elaborate drips down over my candle holders like a strange sort of sculpture. 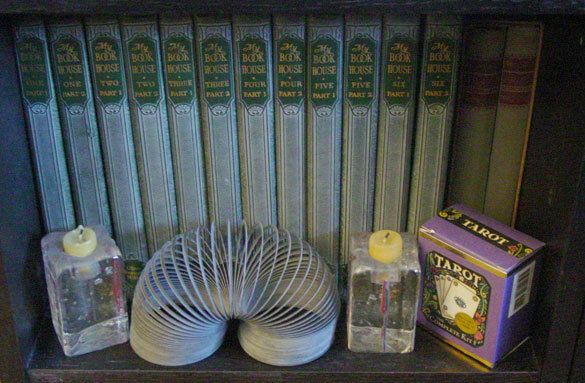 Also the first of many tarot decks, and a Slinky. 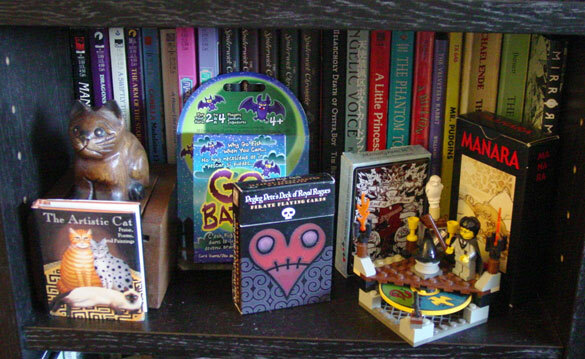 Above you can see the front row of stuff on shelf #2, speaking of tarot decks. I used to have twice as many as I do now, but I’ve reduced a lot of my collections to just the favorites in the past few years. Yes, that’s right, I have less stuff now than I used to. Don’t let it hurt your brain too much. 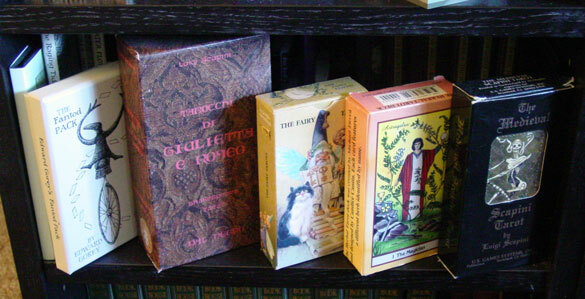 Below, there’s the books hiding behind the tarot decks. Ah, there they are. Mostly this shelf has tiny little short books, though I see that one got put on its side so it would fit with its brethren. 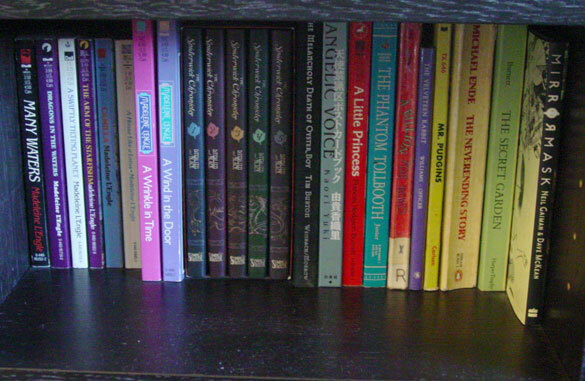 I believe there’s a bunch of Edward Gorey reprints to the far left, and some classics in nice editions on the far right, with comic-related books, postcard books, and other mini coffee table books. The sideways one is The Zen of Zombie. Relatedly, my To Be Read pile is taller than I am, and some of these books are on it. And on to the third shelf! 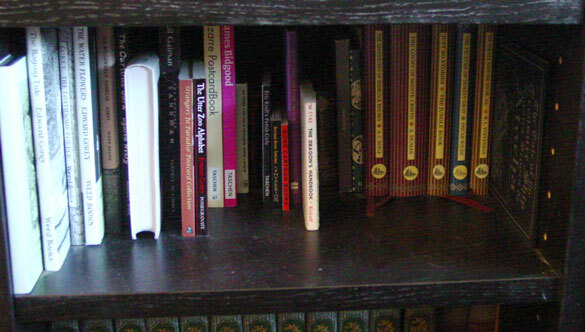 This one also got two photos, even though you can kinda sorta see the books in back. There’s a nifty little cat box and a related mini book, and a bunch of cards, including a Manara tarot deck and some fancy short-run playing cards. And, of course, Harry Potter LEGOs. The old-school kind with yellow minifigs. More books were hiding behind the cards! My collection of Madeleine L’Engle, a lovely boxed Spiderwick Chronicles, a completely random Japanese postcard book, and some other books I loved as a kid, plus a Tim Burton book, and one about Mirrormask. I think the postcard book was too tall for the second shelf, so it got special dispensation. 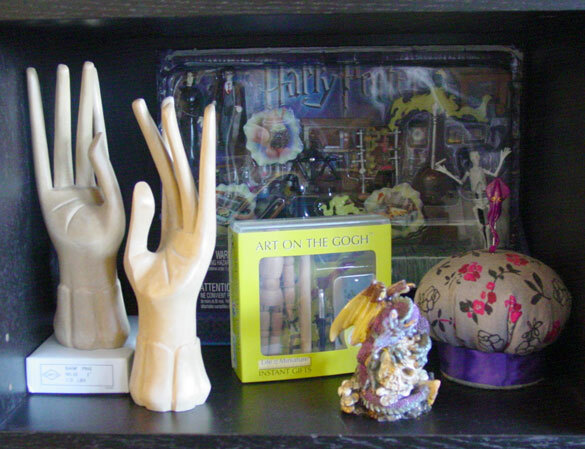 And lastly, we have the fourth shelf (of 8), full of some random stuff that just kinda ended up here. A friend made the adorable pincushion in which my squid pin sits, another one gave me the purple dragon statue, another one gave me the Art on the Gogh mini watercolor set, yet another one gave me the creepy wooden hands, and I bought the Harry Potter Snape’s potions lab playset my very own self at a convention. I have no explanation for the box of bank pins, though. So, that’s it! Stuff an artist keeps in her bookcases, part 1 of a bajillion. Got questions? Want to talk about stuff? Drop me an email! Art doesn't have to be anything but beautiful to change the world. My name's Amy, and I'm an artist. I paint small, strange watercolors & draw whimsical fandom cartoons so grown-up geeks can bring real art into their daily lives. Check out some of my recent works. Want a little art in your life? I want to help you out with that. All of my original art comes with free shipping, so don't sweat the small stuff. Just look and see what calls to you, what you think you might want to live with -- even if it doesn't match the couch. Curious about something I haven't covered here? Drop me a line, I'd love to hear from you. Read my policies on shipping, returns, payment plans and more. It's very exciting stuff. This work by Amy Crook is licensed under a Creative Commons Attribution-NonCommercial-NoDerivs 3.0 Unported License. Join my list today to get a free printable download & previews of new art!